View More In Stockings & Holders - Page 11. ❀YAMUDA christmas stockings bring the joy of Christmas to your home and To continue the warm and good products of 2016 XMAS. ❀WHO WE ARE: YAMUDA ,Dedicated to improving the household decoration environment. ❀Christmas stockings, let the children have a memorable Christmas. ❀Search for YAMUDA for more of the Christmas decorations for 2017 XMAS. Now the sale price is the lowest price ever! Buy them now and they are nice to your family 2018 Christmas. 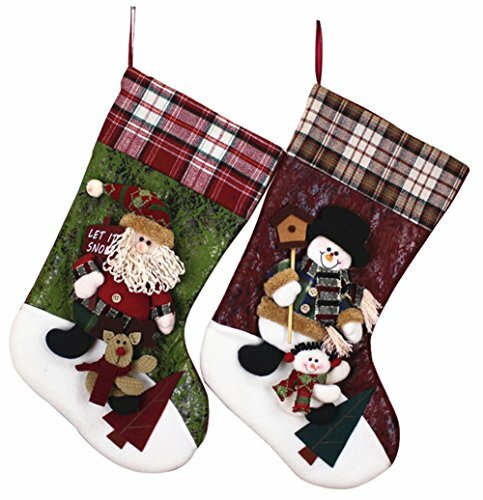 2018 New Year Christmas Stockings Socks Plaid Santa Claus Candy Gift Bag Xmas Tree Hanging Ornament Decoration. The stockings are made of high quality material with delicate appearance and exquisite workmanship. Look awesome! Super cute, new addition to your 2018 Christmas decor . If you have any questions about this product by YAMUDA, contact us by completing and submitting the form below. If you are looking for a specif part number, please include it with your message. Northlight Blue Green and Gold Braided Peacock Shimmer with Plush Cuff Christmas Stocking, 19"